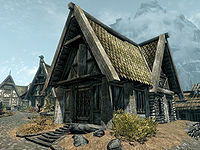 Breezehome is a house that can be purchased in Whiterun. 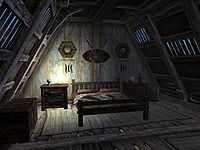 Breezehome is the first home offered to you during the main quest. 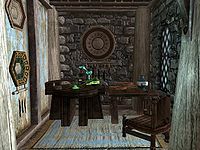 Breezehome is the cheapest house available for purchase in Skyrim, but it is also the only house in Skyrim that does not have an arcane enchanter. It is conveniently placed just inside the entrance to Whiterun, next to Warmaiden's. This makes Breezehome useful for a character who frequently uses Smithing, as a full set of the stations are right next door. To purchase the home, you must first complete the Bleak Falls Barrow quest for the Jarl of Whiterun. Upon completion he will permit you to purchase the house from Proventus Avenicci for 5,000 gold. The total cost of the house (including all upgrades) is 6,800 gold, or 6,550 gold if you have Hearthfire installed and choose to forgo the alchemy laboratory in favor of a children's bedroom. If you are having trouble finding Proventus you can get a quest marker on him through a miscellaneous task given by his daughter Adrianne Avenicci, who can usually be found outside of Warmaiden's, just inside the gates to Whiterun. If you have completed Dragon Rising, Lydia will be appointed as your housecarl and a small bedroom will be added upstairs for her. Her bedroom includes a dresser, an end table, a sack, and an owned bed. Once purchased, Proventus will provide a book, Whiterun Home Decorating Guide, which details the various house upgrades available from him. Proventus will only sell upgrades while actually inside Dragonsreach. If he is on the Great Porch or his bedroom, the option to decorate your house will not be available. If the Stormcloaks take over Whiterun, Proventus will move to Solitude and no longer offer you any upgrades. Instead, Brill will be able to sell you upgrades in Dragonsreach after that. It consists of only one zone, which is the interior. When first purchased, prior to any upgrades being bought, it is dirty, covered with dust and cobwebs. It has a double bed and an empty chest upstairs. Downstairs there is a long wooden table and bench. The only other items are crates, a couple of unusable chairs and an unlit firepit. If you have already been made a Thane, Lydia's room will already be fully furnished, cleaned and walled off from the rest of the loft. There are no other internal walls. There are items that are in the house when you purchase upgrades (see below). The apothecary's satchel contains some rare ingredients. Two iron greatswords and one iron shield are placed on a shield plaque above the bed after you purchase the bedroom upgrade. The other plaque and racks are empty upon purchase. ‡ These can be bought to replace each other at will, the option to replace with each other remains permanently available. % The contents of the chest on the bookcase in the Alchemy Lab is retained in the chest on the wall shelf in Children's Bedroom and vice versa. * This is removed from the house if you install the Children's Bedroom and returned empty if you revert the room to an Alchemy Lab. This is the only purchasable home in the base game that you do not have to purchase in order to become thane. If you complete the quest Dragon Rising while Balgruuf the Greater is jarl, you will become thane, with or without Breezehome. You may want to remove books from the bookcase in the Alchemy Lab before converting it to a Child's Bedroom with the Hearthfire add-on. Books will remain in the room and the ones from the bottom shelf will be under the bed, rendered inaccessible. The apothecary's satchel is safe. if you replace the Alchemy Lab with the Children's Bedroom, it will still hold the same items when reverted back to an Alchemy Lab. Other than exceptions outlined above, all other containers are safe and non-respawning. Just fine. Whiterun is a lovely city, and there are so many other children here- they all love playing together. Initially, the player was going to encounter a squatter, Terek, in Breezehome, but he did not make it into the final game. If you remove a book from the bookcase on the main floor (beside the firepit) that is already placed on this bookcase, the bookcase may freeze, leaving you without access to any books within the case. This bug is fixed by version 1.3.7 of the Official Skyrim Patch. Although, theoretically, Lydia is supposed to sleep in the housecarl's bedroom, she never seems to, and instead has the unfortunate habit of intruding upon your bedroom and using the chair inside. After installing Dawnguard, you may encounter a bug when purchasing decor for Breezehome. 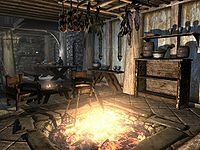 After initially purchasing the alchemy lab, it will not disappear from the list of available decor; it will remain constantly available for purchase and will not appear in Breezehome. You can also use the following console commands to fix the issue. Note that these commands do not require you to actually buy the alchemy lab upgrade. The weapon plaque in the loft and the weapon rack near the front door may be inaccessible. Upon completing the Battle for Whiterun, Breezehome will be unlocked even if you have not purchased the house. However, the steward still requires you to purchase the house for 5000 gold. The option to replace the alchemy laboratory with a child's bedroom may not disappear after being purchased, and the change will not take place. The option to purchase a child's bedroom as well as the bedroom may not be available while Avenicci is on the balcony. You can buy it from him when he enters Dragonsreach. This page was last modified on 19 February 2019, at 15:23.